When it comes to dressing at Walt Disney World, everyone has their own idea of what is appropriate. I am no exception to that rule. I like to think that when I go, I am dressed comfortably yet cute and am not performing any fashion faux pas (with the exclusion of the odd fanny pack which will be discussed in a whole separate article). People are constantly asking me what to pack on their big trip so I have compiled a list of my top 10 items to wear, in no particular order. 1. Proper shoes– I am going to start with comfort. This one should be obvious but seeing women walk around in 3 inch heels tells me that may not be the case. Has anyone ever seen the episode of Modern Family where Gloria wears her heels to Disneyland and is positively miserable? She ends up wearing Minnie Mouse slippers. This could be you if you do not wear comfortable shoes. Now I’m not saying to lose all sense of style and opt for crocs (I know lots of people love them but let’s face facts… they are not at all stylish). Sandals, keds, and running shoes can all be stylish. Start there and decide what suits your needs and style. Do NOT choose Disney to be the place where you break in your new, fabulous shoes. You’ll regret it. 2. Layers– Florida’s weather can be a little crazy. It can be cool in the morning and evening but scorching hot in the afternoon. It may be hot all day but freezing cold in the attractions due to the air conditioning. The smartest thing you can do is wear layers. This way, when you need to adjust your own thermostat, you can put on or take of layers as you see fit. 3. Disney Bounding outfit– I’m not saying everyone will do this, nor that you have to, but these are my top ten things to wear and i like to fit the part. I don’t want to dress in costume (with the exception of my ears) but sometimes I want to resemble my fave character. 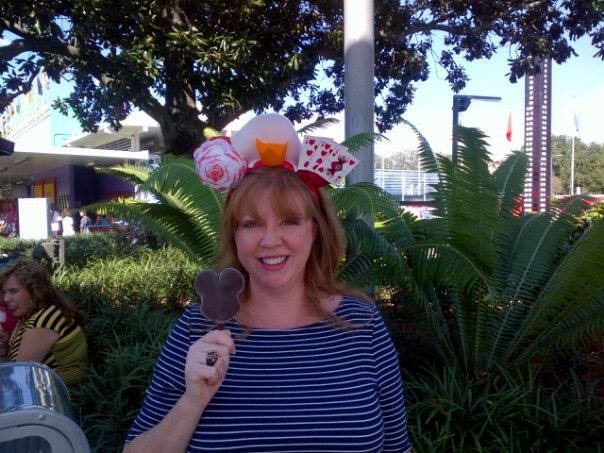 Disney bounding has become uber popular (thanks to Leslie Kay) and I like to pay tribute when I’m there, is I can. Not everyone will know what you’re doing but many Disney fans will and they will smile brightly at you as they pass you. It adds even more magic to an already magical day. 4. Mouse Ears– I’ve mentioned it in number 3 and I’ve done a whole article on mouse ears so I won’t elaborate too much. I’ll just say this, wear them. They are fun and the make you feel like a kid again. 5. A Smile– You’re at Disney!! I shouldn’t have to explain this one…..
6. Lightweight purse– I don’t like to carry a lot around with me at the parks so I keep it light. I need a bag that will hold my camera, lipstick, cell phone and small deodorant (I don’t want to be THAT person). I have a few small to medium sized, over the shoulder purses that go with my assorted color schemes and those are the ones I bring. 7. Poncho/Raincoat– It is inevitable in Florida that it will rain at some point during the day, even if it is only for 10 minutes. It is your choice as to whether or not you get drenched, purchase a poncho at the park or come prepared. I choose come prepared. The choice is yours. 8. Accessories– I don’t usually leave my house without my accessories so why would I go to a park (think of all the pictures that get taken) without them. I don’t go overboard but earrings and a cocktail ring always round out my outfit in some way. I have my assorted Disney earrings and jewelry that I like to pack and rock my Disney side at the park. 9. Sunglasses– I have super sensitive eyes and Florida is the Sunshine State. I don’t like to spend the day squinting (and think of all those wrinkles) so I make sure to bring a pair of fashionable eye wear with me. 10. Sunblock– I know this isn’t clothing or an accessory but it is still one of the most important things you can put on if you don’t want to end up with a burn on your first day. Sunblock can prevent you from being in pain, laid up in your hotel room and it also prevent skin cancer and wrinkles! This is my top 10 things to wear at Walt Disney World. I’d love to know what you’re top 10 things are. Let me know in the comment box below!